... and it would seem that I just found out after far too much work on a project, that there is an issue with the lines that are copied being pixellated. I have attached a photo to show you what I am talking about. I see there is a box I can uncheck in X11, but that likely won't fix anything I've done already... correct? If that's the case, is there any way to fix this without redoing all of my work? Also, how can I tell which lines need redrawing? I see some are pixellated when I zoom in, and hard to tell whether or not its ok... any help is appreciated. Thanks. Yes, unfortunately the install instructions need to be followed upon install, else you may lose work... :/ There's no easy way back from raster to vector. You can select all raster images by using the 'select same' function on right-click. So, right-click on a raster image, then do 'Select same' > 'Object Type'. And set it up according to the image under step 5... Where was I to find out of this issue? Nowhere on that linked page does it say anything that resembles it. Would seem that it's a known issue and should be noted on that install page... No? How is one to know of the issue otherwise? Perhaps you have read the FAQ linked on that page? So you set this up correctly before you used Inkscape? Yes just like in step 5 of the link. It would seem to still copy over vectors as a Raster? So basically as I understand, the only way to avoid this is that I need to change how I copy something... "Copy" is a no no and I should be using "Duplicate" instead? The way it reads seems that I can do one or the other and didn't have to do both. I think I've got a déjà-vu. I seem to remember that last time, su_v jumped in when we had a similar issue on the forums. But I don't remember the contents of what she said. To me, it sounds as if unchecking that option only prevents copying text into one direction, as a downside, so it's not a huge deal, if you don't write much with Inkscape, or are using lots of other X11 applications that require copying text from other apps. Ctrl+V in Inkscape (any GUI widget, and on-canvas with active Text tool context and selected text object) pastes text that was copied in a native application with Cmd+C. Ctrl+C of text highlighted in any widget of Inkscape's interface puts the text on the XQuartz/X11 CLIPBOARD. 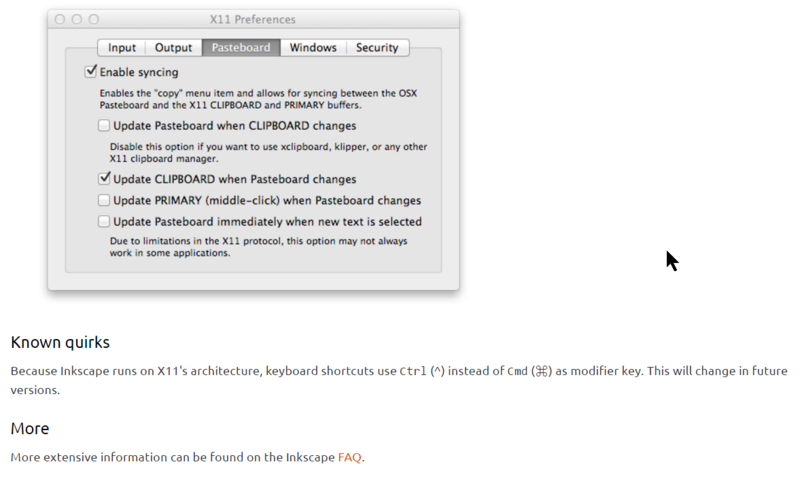 A subsequent Cmd+C syncs the text on the XQuartz/X11 CLIPBOARD to the native Pasteboard. The text on the native Pasteboard can now be pasted in any native application with Cmd+V. Canvas text: Directly copying highlighted text content on Inkscape's canvas does not work - the text content can easily be copied from the 'Text' tab of the 'Text and Font' dialog (or from the XML Editor) and - after manually syncing the Pasteboard - is then available in native applications for paste (with Cmd+V). Not sure what is up. Sometimes I think its my monitor, but the image I attached makes it obvious I am not seeing things, yes? As for "select same object type", in the one project, there are 2 layers each with a component. When I put both on same layer even, "select same object type" will only deselect the component I initially selected. Does this mean it is the only object of its type there? I am new to this all, but as I understand, drawing a path and laying it out draws in vector, no? Or can it also do raster? Can you make a screenshot of the settings for X11, just like the one on the download page? Your monitor is most certainly not causing the issue, no. Whenever you have an object selected with the selection tool, the status line will tell you what type of object it is. Duplicate will always work, no matter which box you check. Duplication is done internally in Inkscape, so doesn't require any clip-/pasteboard. Select same should not deselect the current selection. Select the object, do Select Same -> Object type, then look into the status line. You can also upload a file here, if you want us to check if it contains vector objects or raster images. "(or when you do Copy-Paste on a Mac - are you using the correct keys, or the context menu to copy and paste?)" I think this must be my issue. Correct Keys Vs Context Menu... ? I use keyboard shortcuts or the drop down menu... are they different? My settings are the exact same as in that setup screen on the FAQ page I linked. I uninstalled Inkscape and am reinstalling... so I will follow everything and see whats up. Edit: I am not sure what is up with the photo I attached... The smooth curve is a circle, the other a bezier curve, if that makes a difference? Anyways, here is the SVG file I am working with... it appears it's all paths, but for some reason some lines look pixellated - is it just the size of the drawing and how its displayed or? So, no bitmaps in your drawing Glad we found that out now. The serrated lines are less serrated when you remove the duplicate black lines below - it seems their serrations add up. So its a good vector?? Whats with the serrations tho? If you zoom in, the jaggies don't get bigger as they would with a bitmap. I'm no expert either... with Inkscape or power tools. And as Moini noted, there seem to be elements in the file that might not be needed... some are duplicated with just a stroke, like the wing. TD, the Inkscape expert statement is a heavy understatement, I think You've come very far in just a short time. I wouldn't want to miss you on the forums, the answers and in the bug tracker. Lol, thanks... even a blind squirrel finds a nut occasionally. tylerdurden wrote: Just the display. I admit to having considered the display, but dismissed it when I noticed an adjacent curve was much smoother than the other one... But it is good to know that things are okay. I suppose the real product is the output graphic in the end and how it is printed/used. TD - I most definitely seem to have too many elements in all my stuff... I have trouble with learning things on my own as I tend to go too far too fast... the fill/stroke thing was a bit weird to me... I come from the "paint bucket" fill school or computer art... Not quite sure how I will go about fixing my stuff, but will give it a shot. Edit... I think I see where I went wrong - attached another file... other than a few bad spots where lines don't meet, I've eliminated all double elements (I think). Now I just have to fill the sections in... do I have to use stroke and fill or can the bucket be used? I haven't looked at the file yet, but it's worth noting that the bucket tool in Inkscape doesn't work like a bucket tool in a raster program... the bucket tool creates a new object, it does not change the fill of an existing object. So, if you have a closed stroked path and click in the area with the bucket, you now have two objects roughly the same shape. Usually, it's best to use the fill controls to add color inside paths.